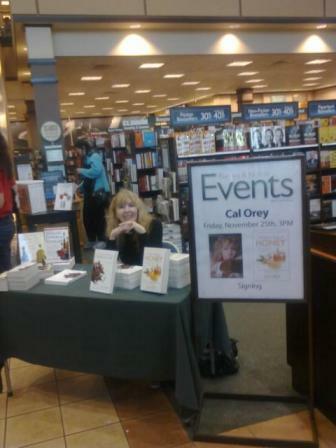 Books2Mention is honored to have Cal Orey as our featured author this month. Cal Orey recently released a new book entitled, The Healing Powers of Honey: a Complete Guide to Nature’s Remarkable Nectar. Cal is an accomplished author and journalist. Her books include The Healing Powers of Vinegar, The Healing Powers of Olive Oil, The Healing Powers of Chocolate, The Healing Powers of Coffee, 202 Pets’ Peeves, and Doctors’ Orders (all published by Kensington). She lives in northern California. B2M presents our exclusive interview with Cal Orey. B2M: Welcome back to Books2Mention Magazine. We appreciate your interest in sharing your new book with our readers. Please tell us about your new book, The Healing Powers of Honey: a Complete Guide to Nature’s Remarkable Nectar! CAL: This latest release is my favorite “child” in the Healing Powers book series. Number four, it’s close to me because I feel a special kinship with the hardworking honey bee. In each chapter introduction I include personal stories in chronological order from when I was a kid to now. These heartfelt anecdotes provide metaphors of the honey bee—at work, going AWOL on the road as I did in my twenties, bonding with humans and animals, and seeking the best “hive.” I took a risk weaving creative non-fiction and non-fiction but it seems to work. It’s two stories in one. B2M: What inspired you to research honey? CAL: During the creation of The Healing Powers of Chocolate, I noticed that honey, like chocolate, was noted in the Mediterranean diet—an underlying theme in my book series. It was the first sign that writing a book on another food of the gods was in the stars for me. And that five-letter word—“honey”—stuck in my mind like a honey bee on a sunflower. What else could follow the class act of decadent chocolate, right? B2M: What has been the most compelling fact discovered during your study of nature's remarkable nectar? CAL: I learned that honey bees make honey and super “bee foods” (including nutrient-rich bee pollen, propolis, and royal jelly) but these amazing insects provide another service; as second-shift workers they pollinate one-third of the food we eat. What’s more, our honey bees are in danger because of Colony Collapse Disorder (a condition that causes honey bees to vanish without trace)—and the cause is unknown. Worse, this puts the human race around the globe in jeopardy if the honey bee becomes extinct. B2M: What sparked your interest in writing health related books? CAL: As a Californian, I’ve always been a health nut. My first article was published in Dog World magazine. The piece was a profile interview with a mobile mountain vet. And that planted the seed for me to write about health for dogs and cats. Later, I moved into health topics for women and men. The rest is history. While I have been tagged as a “health author” since I write about health and nutrition—I specialize in science, too—and it’s these superfoods from Mother Nature that fascinate me. I feel the Healing Powers book series has been successful (translated in 20 languages and purchased by OneSpirit and QPB Bookclubs) because I write in a down-to-earth, first-person narrative, sweetened with stories. Also, I infuse humor in all of my writing so people can laugh while they learn. B2M: Your books offer great information about healthy foods. How challenging is it to begin the process of writing down your thoughts, and doing so in a manner that readers will be able to relate to? CAL: Writing isn’t the challenge. It’s researching a topic, digesting the scientific material, and decoding it in reader-friendly Cal-ese so the mainstream audience can get it without yawning that is an adventure with obstacles. B2M: In the book you offer several healthful recipes using honey. Do you have a favorite among them? CAL: There are many recipes that are to live for and created by pro chefs. However, my own Coconut Custard Pie is a winner. Sweets eating sparingly are included in the traditional Mediterranean diet (it includes eggs) and are not off-limits to the French. I use organic milk, European-style butter, brown eggs, orange blossom honey, premium coconut, and garnish a slice with fresh fruit. It would make any honey bee proud. B2M: There are also some home cures for using honey. Please share a few with our readers. CAL: Ah, there are so many. I include more than 50 home remedies. I love using manuka honey for wounds. I cut my foot in the summer and turned to this honey; within two days I was healed. Not to forget an unforgettable honey bath in a big Jacuzzi at a fancy hotel. After the treat, my skin was so smooth and silky when I went to visit a beekeeper and his new Italian queen bees. I was in honey bee heaven for a day. B2M: The book reveals that honey is unsafe for babies less than one year of age. Please tell our readers why this is true? CAL: Sweet honey may contain not-so-sweet clostridium botulinum spores that can cause infant botulism, because babies less than one year of age do not have the developed gastrointestinal tract of older humans. B2M: What are some of the beauty benefits of using honey? CAL: Honey can help exfoliate, soften, and even make your skin look firmer and glow. This is why some spas around the nation and world include honey in their spa treatments. Milk-and-Honey Bath, Manuka Honey Drizzle Body Masque, Orange Blossom and Body Wrap, and Manuka Honey Drizzle Pedicure are just some of the sweetest beauty treatments. But I also include DIY beauty recipes. CAL: I went to Coffee World. Yes, I entered the land of coffees—all types. It was an awesome experience that I cherish. I morphed from a naïve girl in the burbs who savored coffee ice cream cones to a grown up java snob whom has enjoyed the healthful perks of coffees—exotic roasts to flavored varieties. The Healing Powers of Coffee will wake up people when it makes its splash into bookstores on July 31, 2012. B2M: Cal we encourage you to continue writing interesting books that deal with health and science. We look forward to hearing more from you. You are welcome to visit the website of Cal Orey at www.CalOrey.com.